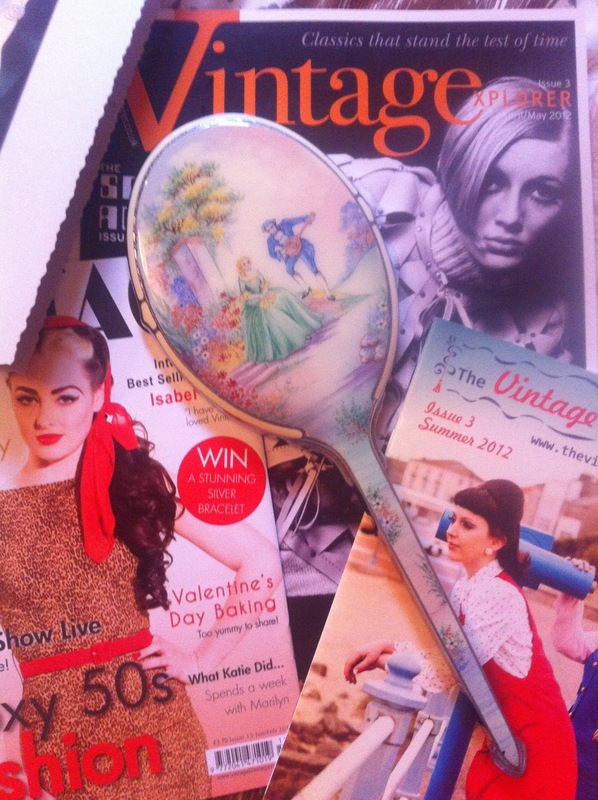 My name is Mia, and I LOVE vintage! 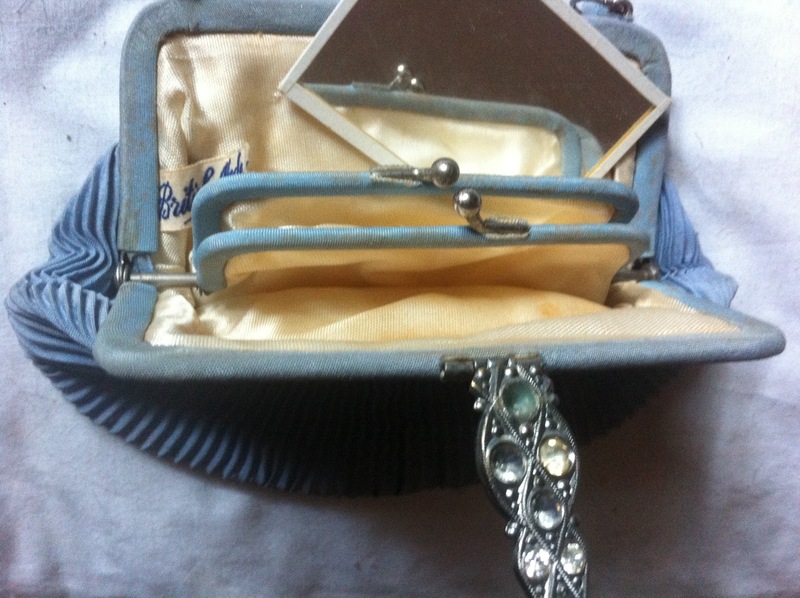 Fur, Hats and Jewellery from the 1910's to the 1950's are the bits I especially look out for, but I collect all sorts, and blogged about my favourite era's here - however I thought I'd share with you some of the beautiful vintage items in my collection. 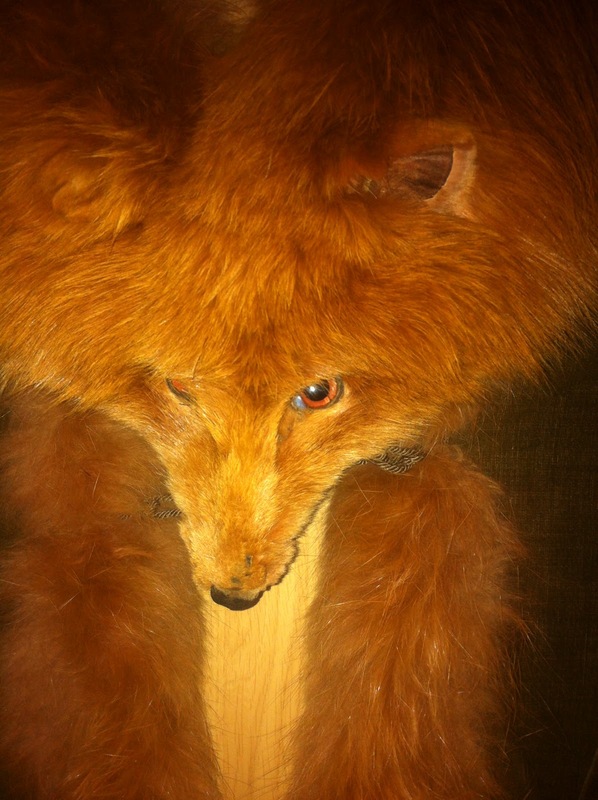 My most prized vintage possession is also probably my most contraversal: this stunning double fox fur is from the 1930's and it was won on eBay for a song! 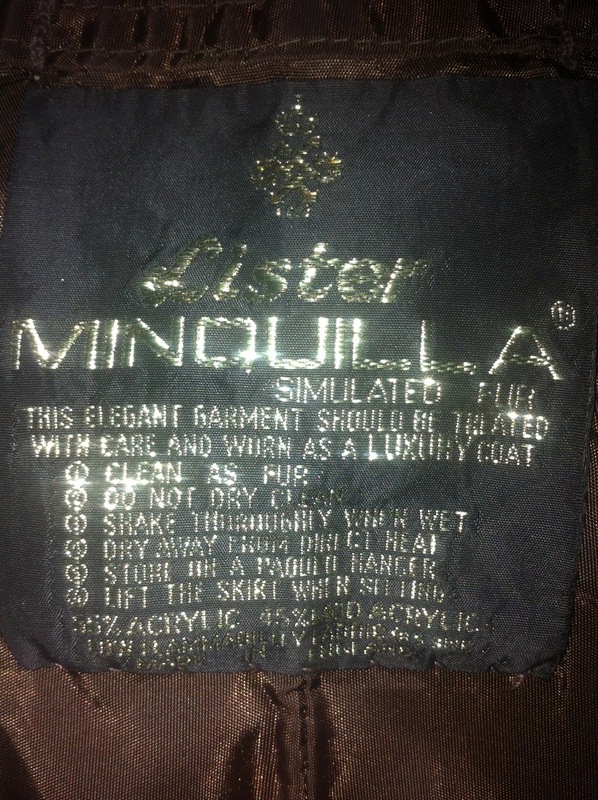 The quality is incredible as it has been stored, with great care, in someone's wardrobe for the last fifty years (so smells a little musty). 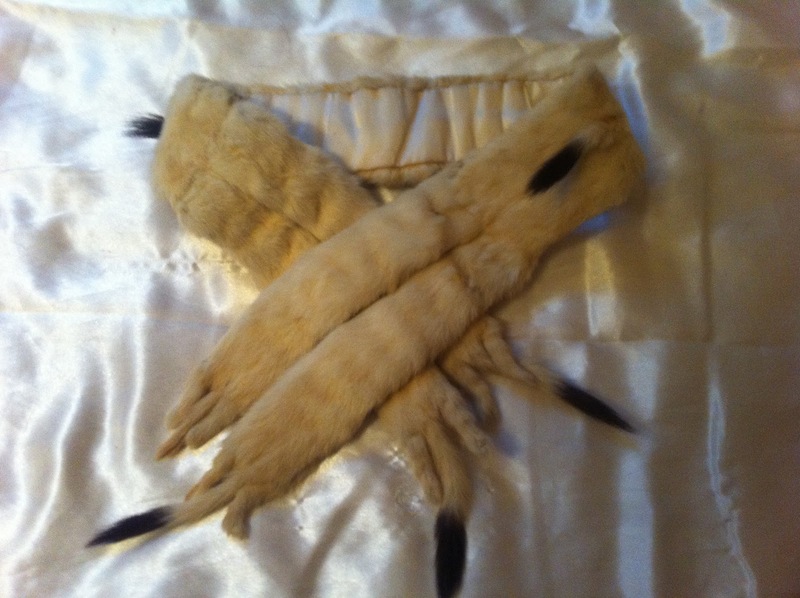 With one head but two complete bodies, this makes a wonderful statement but can only be worn at a very few events due to the strong emotions real fur evokes in some people. I call him Ronnie, by the way: no reason, he just looks like a Ronnie! 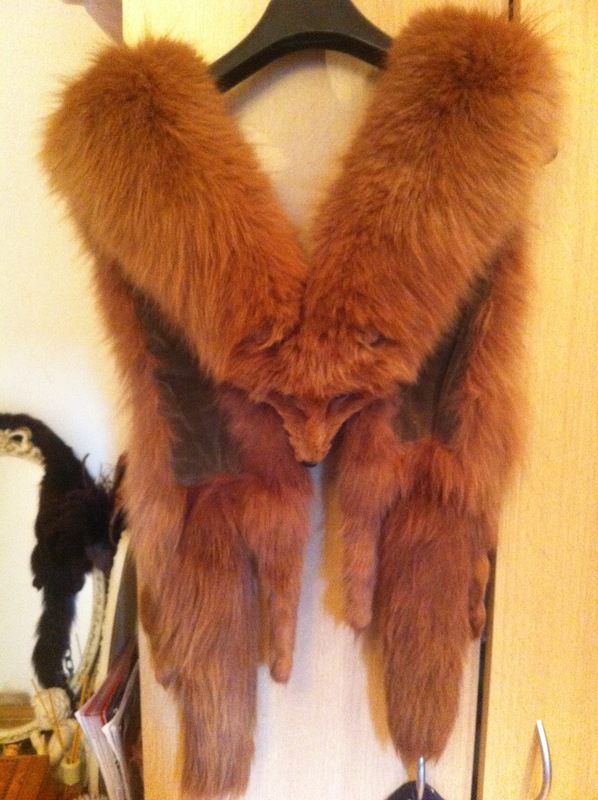 This was the first real fur I ever bought: from Stockport Vintage Market for quite a bargain as I got another piece thrown in too (it's worth hanging around until the end of the day to see if any stall-holders are trying to get rid of stock!) 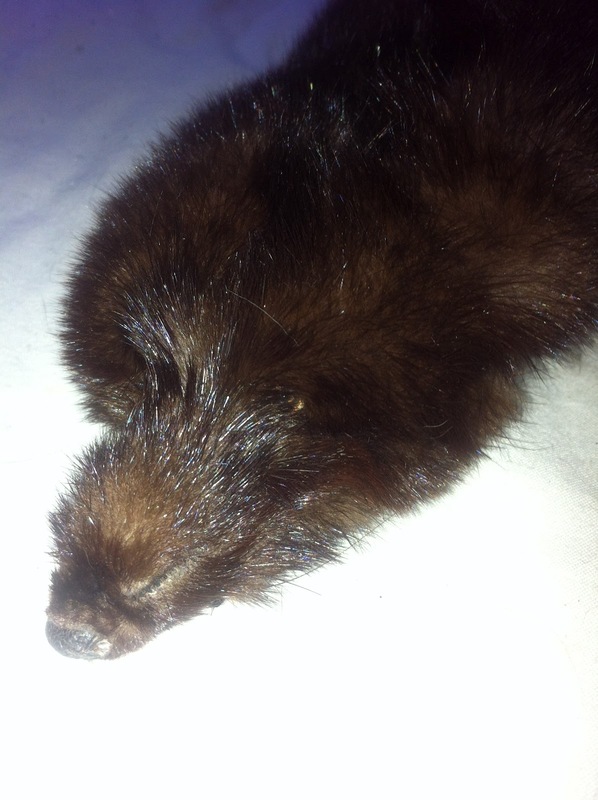 I think it's ferret, but I'm not 100% sure! I call it Stitches as there is a little damage to one side of the nose that has been stitched closed. I'm not 100% sure whether this is genuine 1930's however the company on the label was registered in 1857 and had premises in Halifax until around 1936 so I assume it's around that old! 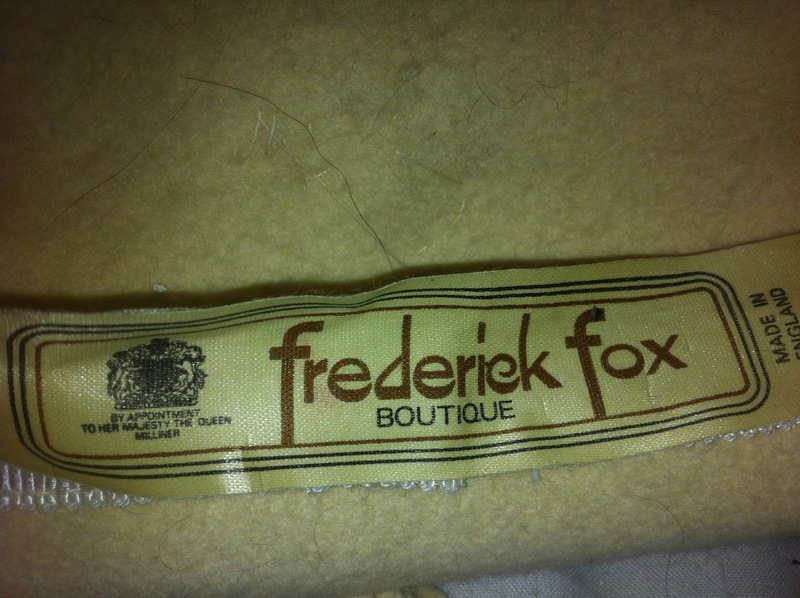 This was the fur I bought together with Stitches at the Vintage Fair - again I think it's 1940's and it feels like mink but there's no label on this one to be able to tell. There are two bodies with two sets of feet and tails, and although it's quite small, it sits perfectly over a cardigan or coat collar. I call this one Tails because of the amount of tails! I was told it was 1940's however I could be wrong. 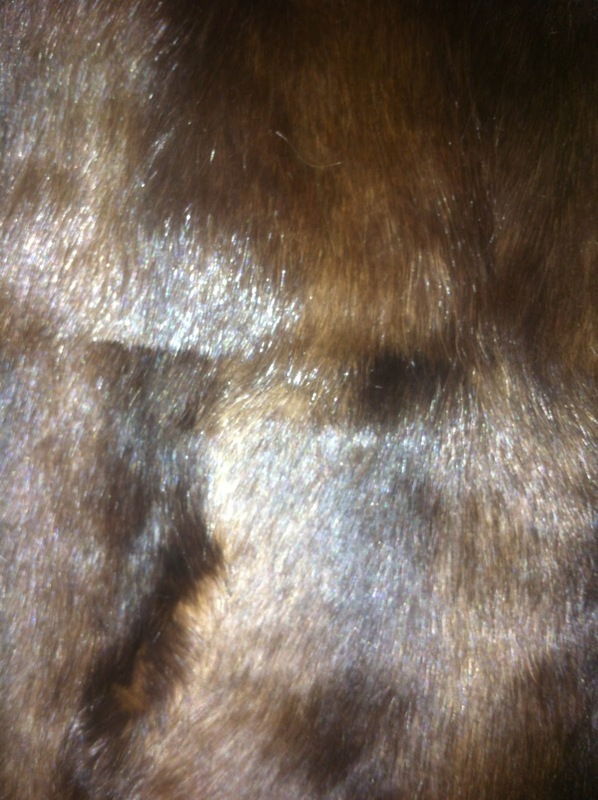 This beautiful fur was bought for me as a birthday present from the lovely Glorian Gray - I don't really know what kind of fur it is to be honest! The colours are stunning and the shading in the stripes looks so beautiful when the light hits it. 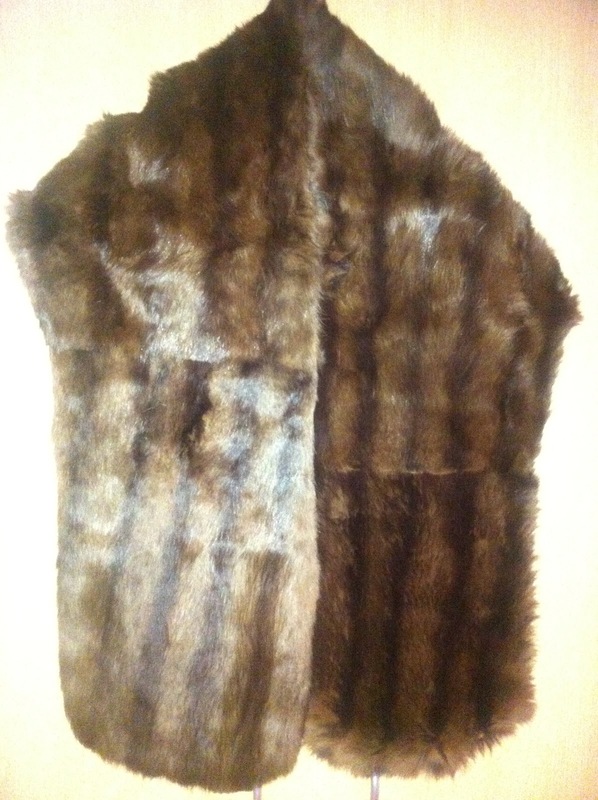 It's a particularly large piece of fur which makes it perfect for throwing over my shoulders when it's cold, or after a show over an evening dress. 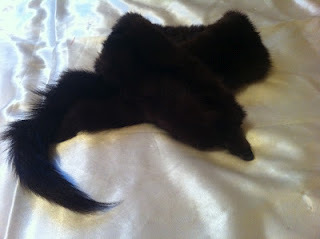 This is not real fur, but is a good simulation - the stole is shaped and fits perfectly over shoulders: I wear it closed with a brooch usually but the shaping is so good that it doesn't really need it. 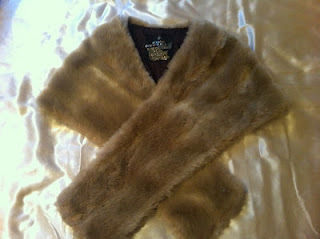 There are several pleats of fur which makes it look really luxurious - another fabulous find from the Stockport Vintage Fair! This is surely one of the most unique vintage items I've seen - obviously as time goes on, the quality of clothes specifically degrades, so to find something like this, from the early 1910's, in such wonderful condition, is remarkable. 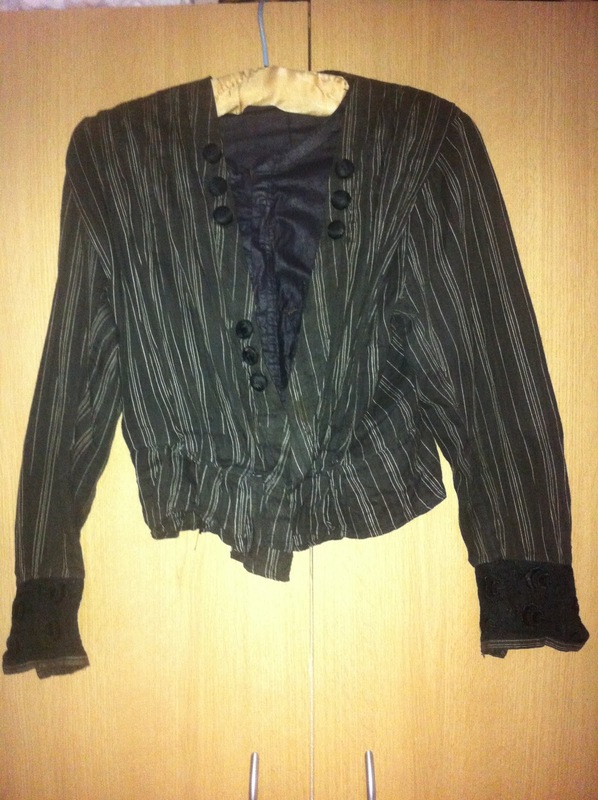 It is mostly handmade, as most clothes for the middle and upper classes would have been, in dark brown pinstriped cotton with a silk modesty panel, gorgeous lace detailing on the cuffs and covered buttons. 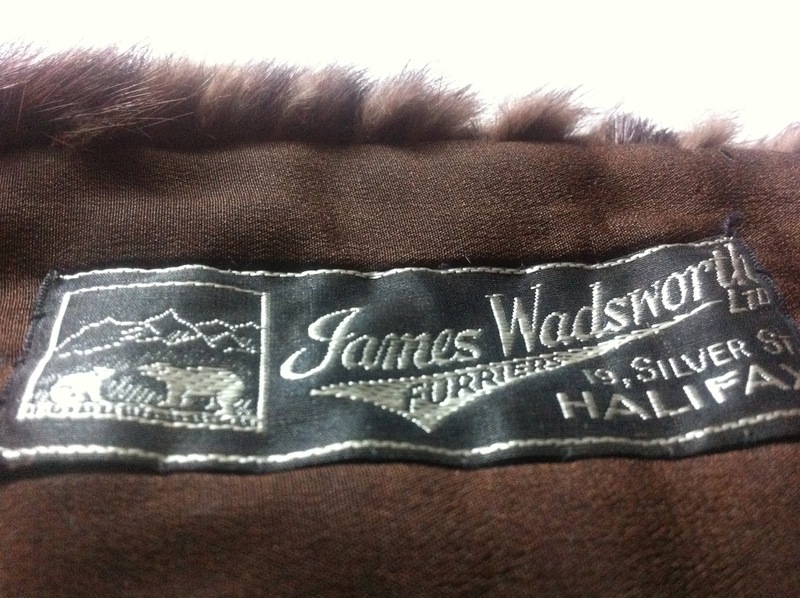 The only sign of wear and tear is a little rust on the hook-and-eye fastening of the modesty panel so it has weathered the years incredibly well! 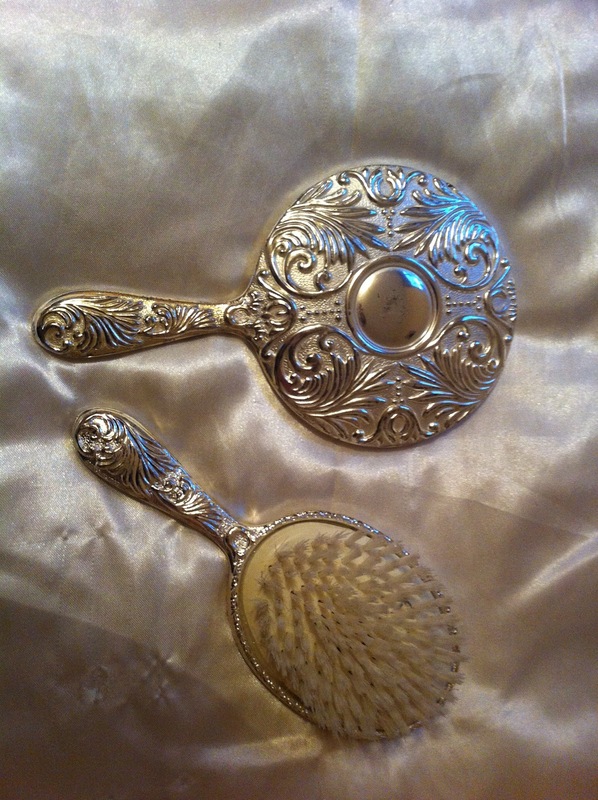 I bought this from an antiques collector friend of mine, who has a talent for finding beautiful and unusual things, that he knows I'll go crazy for! 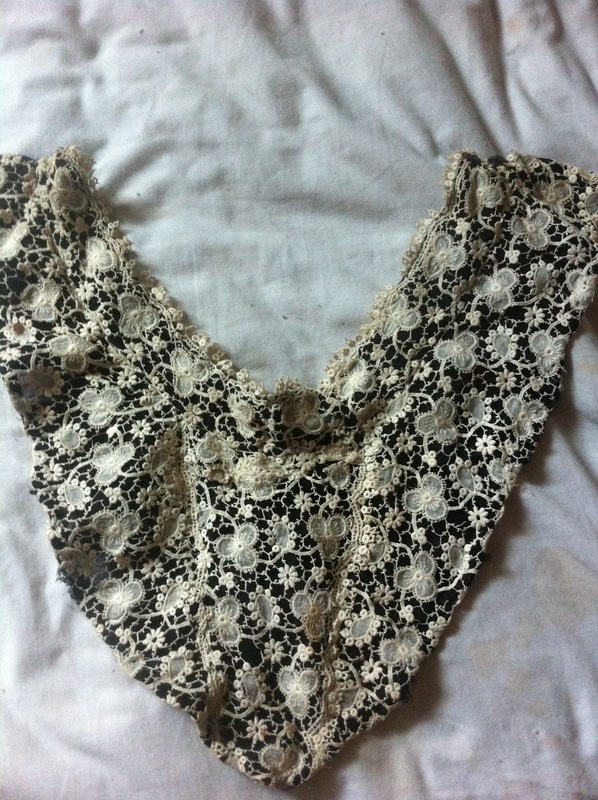 This gorgeous creation is a handmade lace collar from the late Victorian era, possibly 1890's. It was designed for adding over blouses as a modesty panel or to add a little more detail to an outfit. 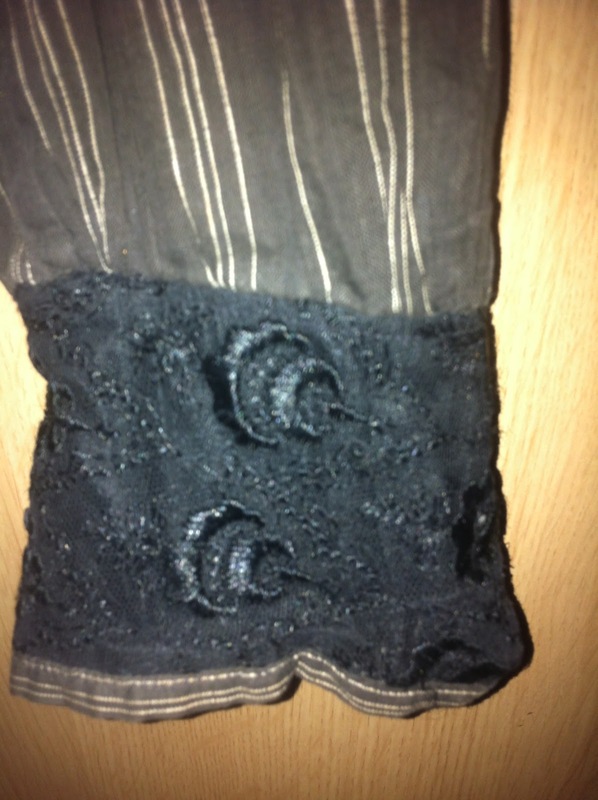 The beautiful, handmade lace is stitched over a black backing and secured with two press-studs. 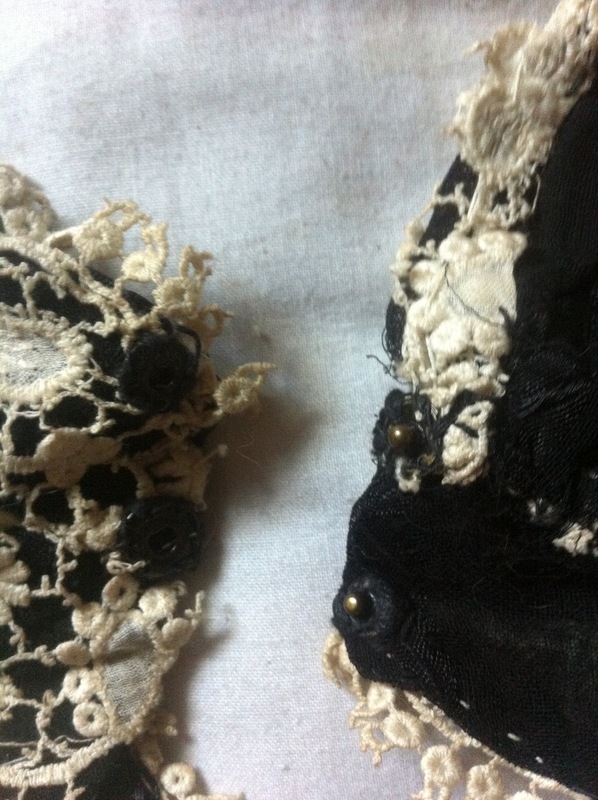 The only damage is a little discolouration, some rust on the studs and a small hole in the lace pattern. 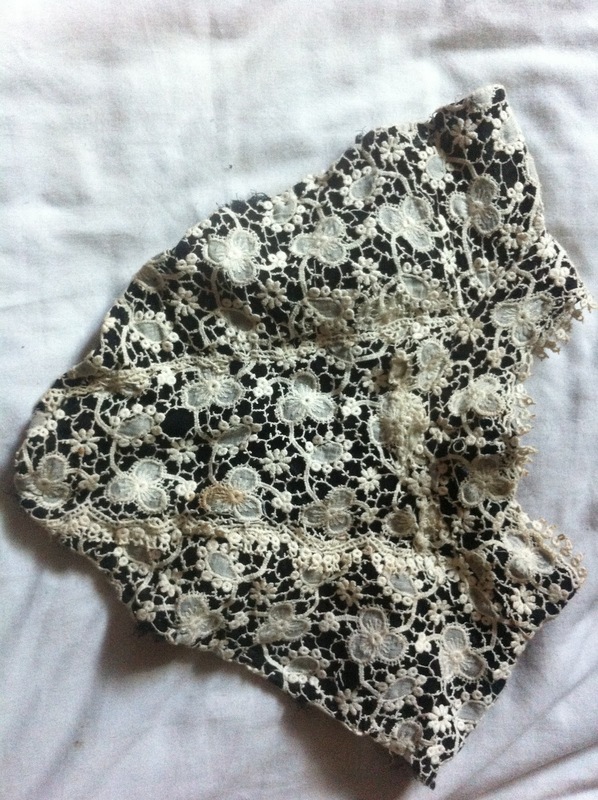 However it is still a beautiful piece and is among the oldest things I own. 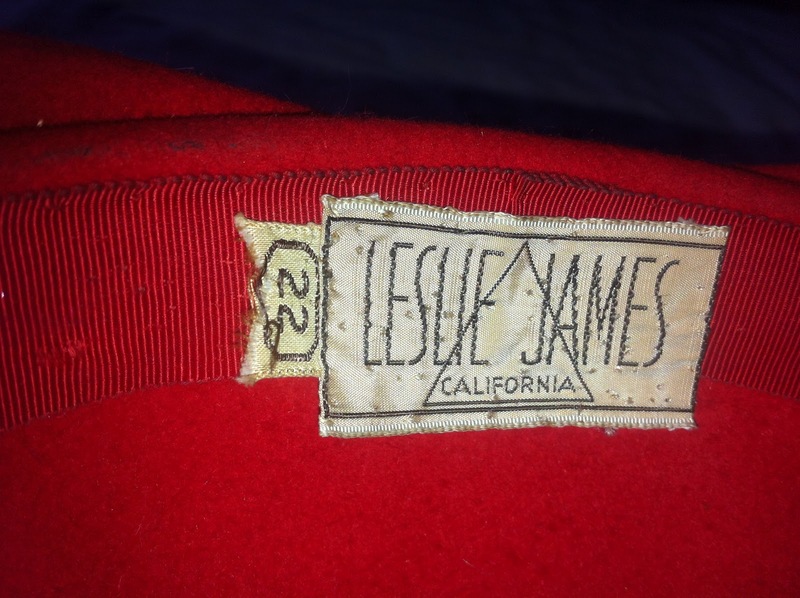 This beautiful vintage hat from the Leslie James company in California was a gift to me by my antiques friend - it is a gorgeous soft red felt and is shaped so it can be worn in a few different ways. 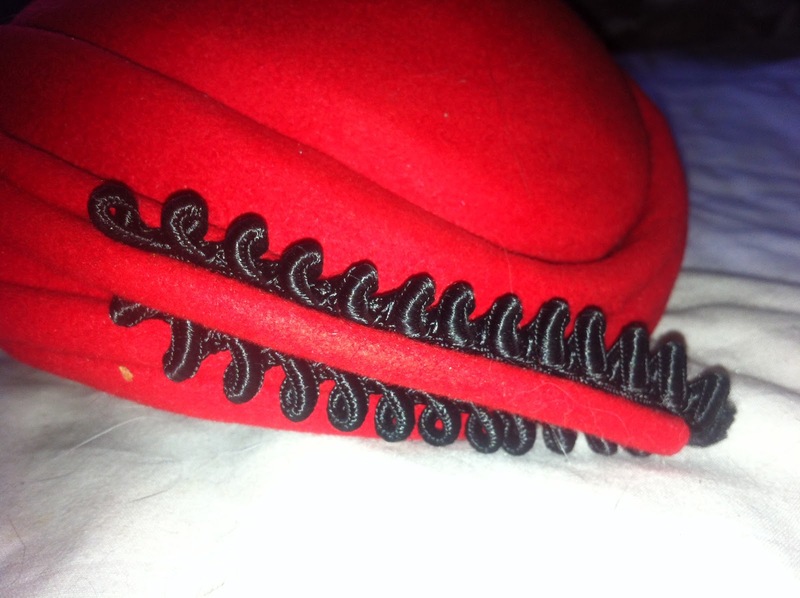 There are bands of red felt around the edges and a black fabric trim on one side. 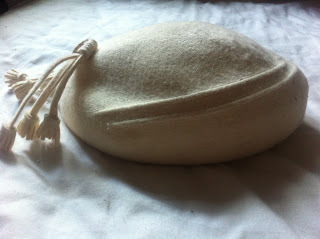 I was told this was 1940's - the company was trading from the mid 30's to the late 60's so it's reasonable to agree! 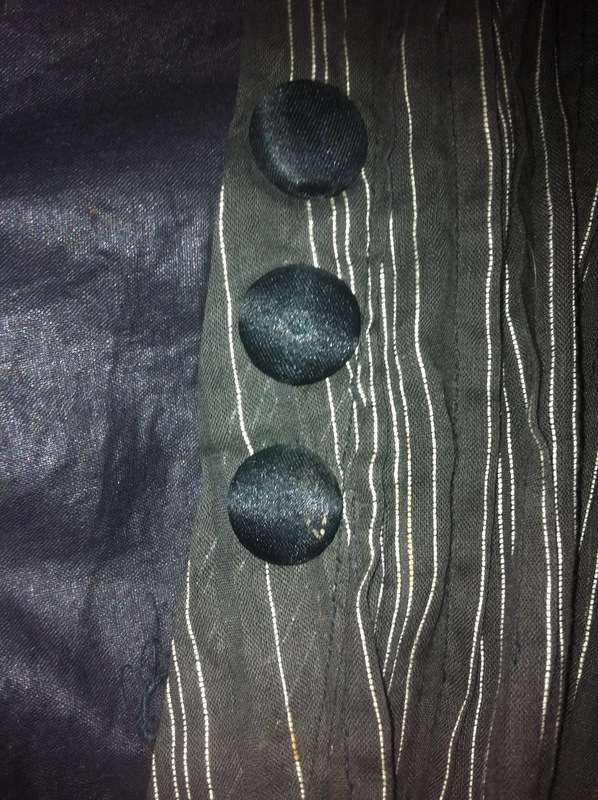 I picked up this little gem at 'Room at the Top' Vintage store in Stockport one rainy Sunday. It is a tear-drop shaped felt pill-box hat with felt peak detail and white knotted tassels hanging from the back. 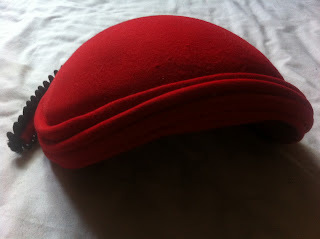 The gorgeous soft felt sits beautifully on the head and it is made by Frederick Fox who has made hats for the Queen, Princess Diana and '2001: A Space Odyssey'! 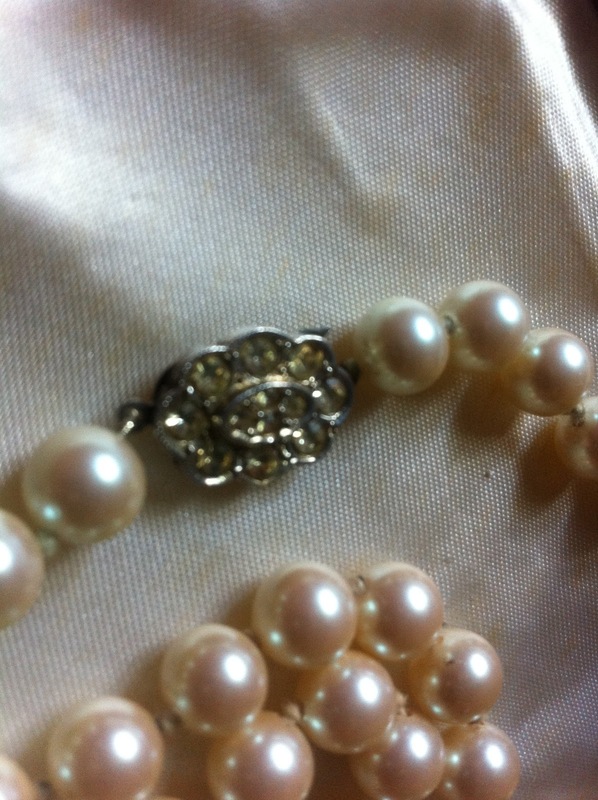 Although it is a relatively modern piece, it is in a vintage style and looks beautiful as part of a 1940's styled outfit. 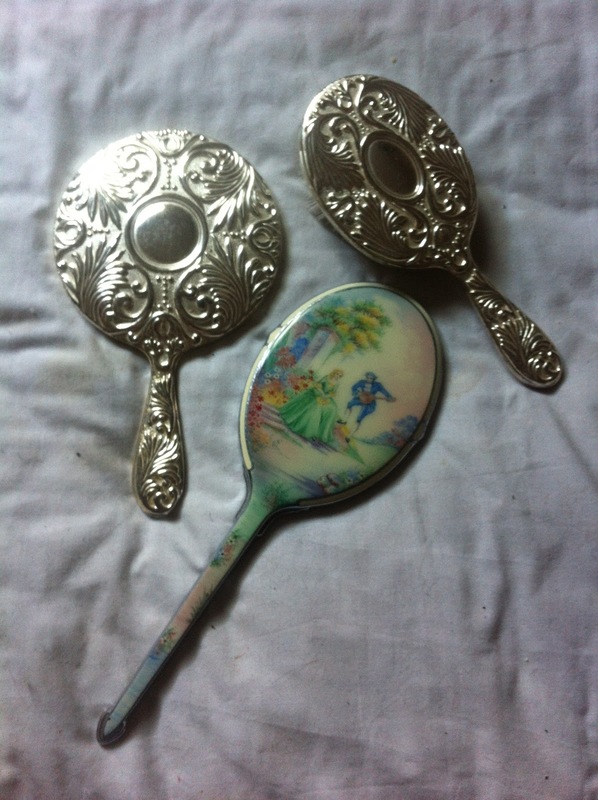 I wish I had a beautiful, large dressing table to display these in the way they deserve: the silver plated mirror and brush set are from the 1950's and have only slight tarnishing to show their age - these were another find from the Stockport Vintage Village (I spend so much money there!) The painted hand-mirror is from the 1920's and is in such incredible condition for its age. This was a birthday gift from my antiques collector friend as he knows how much I love the 1920's - it has been hand-painted and fired and, at the time, would have cost more than silver which makes it highly collectable and rare! 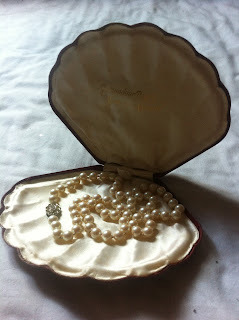 1950's Pearls: "Pompadour Pearls - Pearls for a Princess"
Another gift from my lovely antiques collector friend! Pearls are my birthstone and I absolutely adore them. 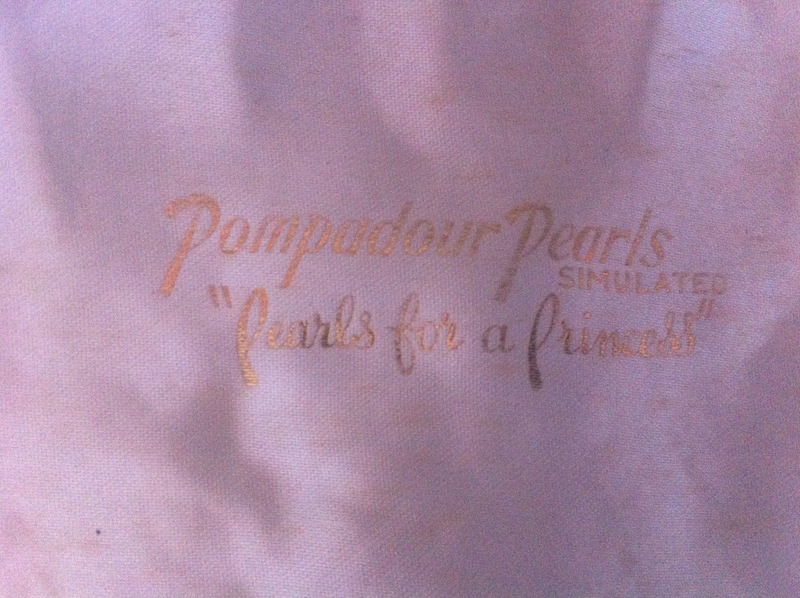 Pompadour Pearls also used the slogan "Pearls for a Princess" and since my nickname is the Burlesque Princess, it is especially fitting! These beautiful 1950's simulated pearls are in their original box and have a lovely diamanté clasp - I wear them so rarely as they are very precious to me, but I always get compliments when I do. 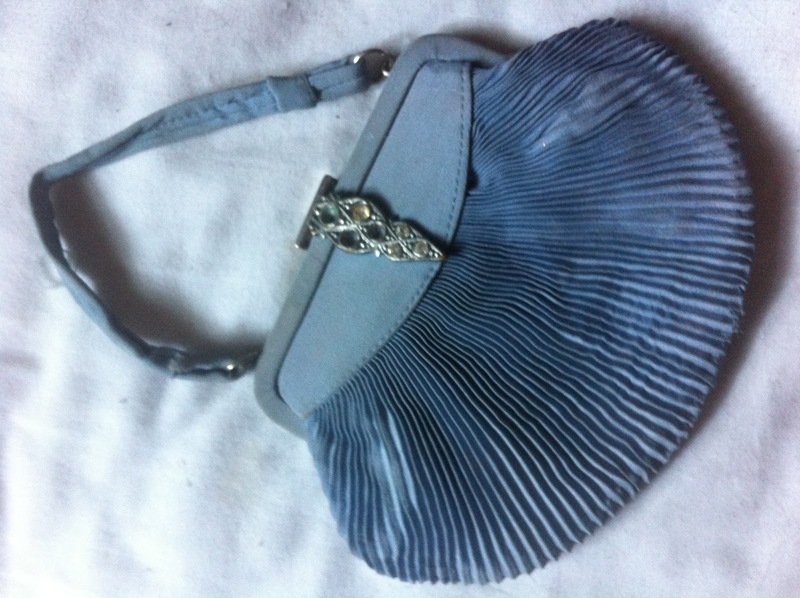 Another little bargain from 'Room at the Top' vintage store: this 1920's pleated silk purse in a beautiful pale blue with cream lining, came with the original hand-mirror still inside! It has a little clip section for loose change and is just big enough for a lipstick and a phone - what more do you need?! 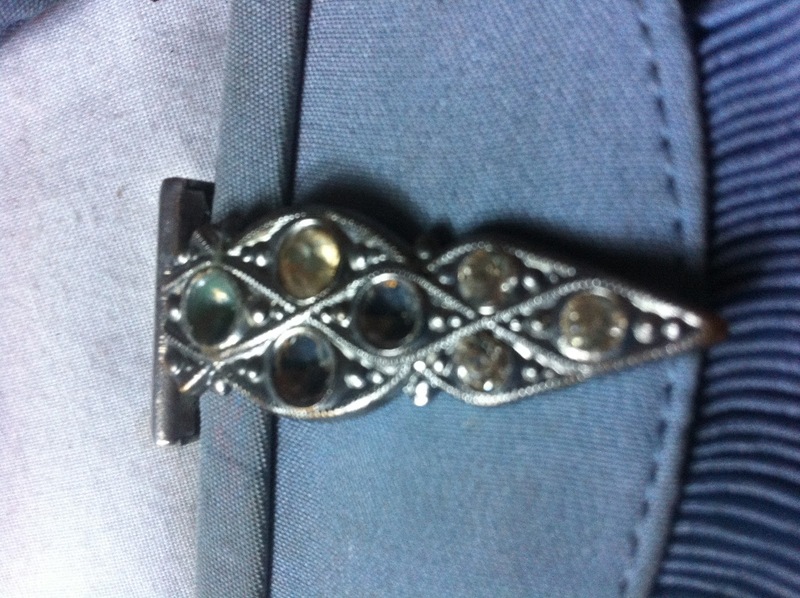 The clasp is missing one or two paste jewels but the metal detailing is gorgeous enough without it, and the few loose threads in the handle are the only signs of age.